I had Darrin do some jobs for me last year. His work is excellent, never had any complains from any of the customers. Darrin knows the roofing business and is good at it. Daza Roofing was strongly recommended to us by a friend in the construction business, and they provided a premium product at excellent pricing. Darren’s crew arrived precisely on time and worked diligently through the day to complete the job thoroughly and professionally. We were very impressed with their attention to detail, the job came in exactly as quoted, and there was zero impact on our yard or driveway. From the first time I met Darren with Daza Roofing he was easy work with. He is very personable and friendly and always goes the extra distance to make sure that the job is done well, on time. Our new roof has now been tested by two heavy snows and resulting melts – and we are delighted. Having done a roof myself in younger days, and dissatisfied with the prior roof here, I researched specifications — which you exceeded as per your normal practice. The schedule, time keeping, work ethics, expertise, quality, effort, and clean up made for an impeccably completed project, which was second to none. We have no hesitation in recommending you and your company to any interested future customer. I was extremely impressed by the work Daza Roofing completed on my house. Not only was the work done in a prompt efficient manner, but the clean up was impeccable. I wanted you to know that we are very pleased with the new roof your company installed at my home. It was a pleasure working with you from start to finish. 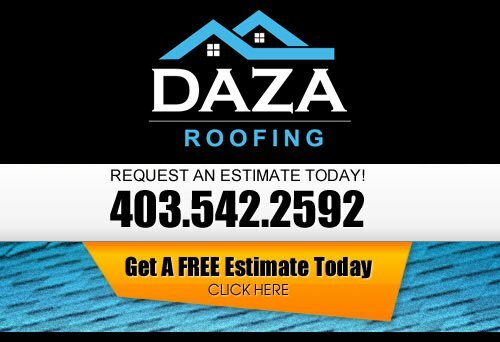 If you are looking for Testimonials or Client Reviews from a professional Calgary roofing company, then please call us today at 403-542-2592 or complete our online request form for a free estimate.